The pioneering endeavours of auto greats Henry Ford and Taiichi Ohno have deeply impacted the industry. The pervasive influence of their ideas can be seen in most of today’s manufacturing environments. Ford moved away from craft production techniques to mass manufacturing using flow techniques of an assembly line that could push out a car in an astonishing 81 hours! With his model T car, the manufacturer achieved unprecedented success of making a car affordable for the masses. Ohno, like Ford, applied his energies to fine-tune flow in an environment of wide variety yet small quantities per variety. He demonstrated that by yoking production and consumption – the two have to be viewed as inseparable – plants can not only achieve impeccable flow but also keep at bay problems like inventory pileup. The formidable Toyota Production System or just-in-time production that Ohno conceptualised has stood the test of time and continues to enjoy the status of holygrail. To facilitate the flow of inventory, Ohno brought in the concept of Kanban cards or bins which act like whistles or flags at races. The cards/bins provide the cue for a work center to begin production of a particular component. The bins or cards were transferred only when the downstream workcenter has consumed the same. No kanban card/bin means no work, literally. A work centre can choose to idle till it receives a cue; utilisation is sacrificed to serve the superior cause of inventory movement. Once the plant is regimented, it is pushed to constantly up its game. Kanban cards and bins come into play again; their numbers are reduced to jolt the production process to a higher gear. Concepts such as standardisation, 5 s, autonomation, offer additional support toward reaching the ultimate goal –flow. Armed with these techniques, Toyota was able to offer highly reliable yet affordable cars to the masses. With its decisive competitive edge, the company made a place for itself in the closely-guarded US market. The unparalleled success of the Toyota Production System has inspired companies across the world. Most auto manufacturers in India follow guidelines fashioned after the kanban system or bins. Some companies shrink plant space in order to aid inventory flow. This, combined with space management tools such as 5s, cellular layout can have a transformative effect on the plant. Clean and organised, such plants seem TPS-compliant. Visually, they resemble the superstars of the auto world. The question, however, is what do they look like below the surface? Is their transformation superficial or skin-deep? To answer these questions, one needs to examine the supply chain of these plants. If a company has wholly and truly adopted TPS, its supply chain should be highly stable and agile. To understand how these two are linked, we need to look at how a typical tier I component plant functions. 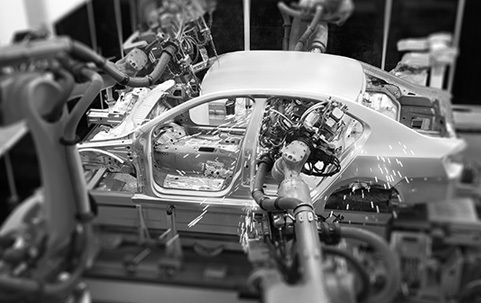 Most auto companies are assembly-oriented – Thousands of components are assembled to make one vehicle. An assembly can be delayed if even a single component is unavailable or missing from the kit. Now, the stability of a plant is directly proportional to the kit coverage (number of days of planned production for which kits are complete). Higher the kit coverage, more stable the plant. During the course of our work in the auto industry, we have heard one resounding complaint from everywhere – poor kit coverage. Purchase managers run around to put together whole kits; vendors are at the receiving end of expediting requests; plant managers shuffle schedules, make and remake production plans based on the components available for assembly. Often, schedules are not stable even for a shift, let alone for a day. The scene is no different at the facilities of the many vendors that supply to OEMs. Most hold a month’s inventory despite being just a few hours away from their customers (the OEMs), who do not get the required components despite being within reach of the inventory! See the irony here? Curiously, these are the same OEMs who claim to have implemented TPS or JIT, the very systems that assure flow, and therefore, stability. This situation then begs the question – why aren’t today’s manufacturing environments stable? A widely fluctuating demand can make space limitations or even kanban limitations totally ineffective. Toyota dealt with this challenge by smoothening of demand not just at aggregate volume level but also at product level. The technique is called heijunka. Heinjunka enables one to keep the plant away from wild vagaries of market demand from affecting the plant. When heijunka cycles are short and every product is made nearly every day, the market can be reasonably expected to subordinate to the plant. It took Toyota nearly 20 years to perfect the system after sustained efforts in reducing set ups times and improving reliability of components in the entire ecosystem including inhouse plant and vendors. The most difficult part of implementation of TPS is heijunka and kanban. Companies trying to implement get caught in the starting conflict. When parts availability is poor, and demand for specific vehicle is widely varying across months, it is very difficult sustain a stable heijunka at the assembly plants of the OEMs. On the other hand, kanban system cannot be implemented in the production system of an auto component vendor if assembly operations of OEM are not smoothened. When plants are exposed to demand fluctuations, further amplified by parts availability fluctuations, the bins or kanban cards become ineffective. So instead of acting as pull based cues for triggering production, the bins simply move inventory from component vendor to OEM. In this scenario, plants miss the crucial messengers that keep production in tandem with demand. Stocks are produced according to a forecast. These stocks are then pushed to dealers to achieve primary sales. In other words, in the absence of a 'pull' trigger (kanban cards, bins), OEMs are forced to shift to the default 'push' mode. OEMs are unable to commit completely to TPS or JIT, find it impossible to follow the system in its entirety. They continue to straddle both push and pull systems. Their vendors are made to supply as per a weekly or a monthly forecast. This restricts their ability to respond quickly to OEMs' daily production plan changes. And so we have the long list of problems including expediting, incomplete kits, rescheduling and so on. Daunting as it may sound, an entire supply chain can be made to move from push mode to pull mode . The key direction of change is not to seek the perfection of heijunka – a mix model levelled schedule. If one is able to get good enough smoothening of volumes (in line with demand), he can implement a consumption-based pull system. The first steps need to be taken in the demand side of the auto OEM. The manufacturer can move inventory to the dealer based on consumption and not as per a sales target. For this, the OEM needs to hold higher aggregated inventory at the central warehouse as compared to the dealer. The OEM also needs to base production on consumption from the warehouse. Pull-based planning along with processes to regularly change the inventory norm to keep up with the changes in the observed sale rate (as compared to supply rate) can help auto OEMs transition from push to pull without going through the excruciating exercise of smoothening demand. The central warehouse provides good enough dampening of demand to implement a pull system without a rigid heijunka. The good enough smoothening can be transferred to the multi-tiered vendors through similar consumption based pull signal. The change can begin with the component vendors, too. Instead of looking to the OEMs to provide an accurate forecast (an oxymoron and a near-impossibility), they can begin to produce to actual off-take from the warehouse. They can cut daily disruptions to a bare minimum by creating a buffer that would protect them from maximum consumption during supply lead-time. They can react to consumption from the buffer level (or norm level). This norm or buffer can be used to trigger production – when the norm level of a particular SKU dips, the plant gets a signal to produce that particular SKU. Once we’ve established the norm level and begun using it to draw up production schedules, we need to devise a colour-tagging system to prioritise production of the various SKUs. This system would give the plant a top view of actual stock-versus- norm for each SKU. An SKU with actual stocks closer to the norm (between 2/3rd of the norm to full of norm) can be tagged as green; an SKU whose actual stock is between 1/3rd and 2/3rd of the norm can be marked yellow; an SKU whose actual stock has fallen below 1/3rd of the norm can be tagged red. (In a stable plant, most SKUs would stay in the yellow zone). SKUs tagged red to be prioritized over those tagged yellow and green. This colour system will provide flexibility to the plant to create own schedules for the day rather than following a fixed rhythm of a heijunka schedule. This system can be used by tier I and tier II vendors for manufacturing feeding components. Reducing supply lead time of a tier II vendor would bring down level of inventory at a tier I vendor. Clearly, helping the former shrink supply lead time is in the best interest of the latter. It also serves the larger and more critical purpose of building a supply chain whose raison d’être is seamless movement of inventory. This transformation (moving to a pull system known as the 'Theory of Constraints' (TOC) approach) can be started from any point without disturbing the other entities of the entire auto supply chain.